According to a report from Iran, which, together with Russia, is a principal backer of the Syrian government of President Bashar al-Assad, Syrian army units have conquered 20 square kilometers out of the total of 45 square kilometers making up eastern Aleppo. The government advance has been extremely rapid, suggesting a rout of the US-backed militias. The ground offensive follows two weeks of intense Syrian air strikes, launched after a month-long cessation of bombing by both Syrian and Russian warplanes. Syrian government media reported that the army had captured the Sakhour area and was clearing it of mines. Government control of this part of the city would effectively split the area held by the “rebels” in two. The government advance has led to tens of thousands of civilians fleeing the areas controlled by the Islamist militias for safety in both government-controlled western Aleppo and the Sheik Maqsoud district held by the Kurdish YPG militia. The YPG has joined in the offensive against eastern Aleppo, further complicating the US intervention in Syria. While Washington has backed the Islamist militias fighting the Assad government, it has also sought to use the Kurdish YPG as its principal proxy force in the US military campaign against the Islamic State (also known as ISIS) in Syria. Turkey, Washington’s NATO ally in the region, has also sent troops into Syria, ostensibly to combat ISIS, but directed principally at preventing the Syrian Kurdish forces from consolidating control over territory near the Turkish border. As a result, on multiple fronts Washington is backing forces that are fighting against each other. The civilians fleeing eastern Aleppo told stories of the horrors of the Russian-Syrian government bombing campaign as well as the repression and terror carried out by the Islamists controlling the neighborhoods in the east. It has been widely reported that the US-backed militias previously shot civilians trying to leave. Before the war began in 2011, Aleppo was Syria’s second-largest city as well as its commercial capital. Western Aleppo, where approximately 1.5 million people live–as opposed to less than 200,000 in the “rebel”-held eastern part of the city–is under the control of the Syrian government. 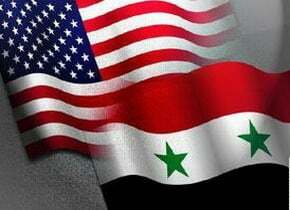 It has come under indiscriminate mortar fire from the US-backed rebels aimed against the civilian population. Both the Russian media and the Washington Post reported Monday that US Secretary of State John Kerry has mounted a new campaign aimed at brokering a ceasefire in Aleppo. While couched in humanitarian rhetoric, the principal aim of these efforts is to prevent the complete collapse of the US-backed militias and the consolidation of the Assad government’s control over all of Syria’s major population centers. The media and Obama administration officials have violently denounced the Syrian government and its ally Russia for the siege of eastern Aleppo. The situation today, however, is the reverse of what prevailed a year ago when the so-called rebels were laying siege to western Aleppo, which faced an imminent humanitarian catastrophe. At that time, there were no humanitarian concerns expressed by Washington. US State Department spokesman John Kirby on Monday denied that Kerry was engaged in “frantic or frenetic, last-ditch efforts” to salvage the US-backed regime-change operation before the fall of Aleppo and the inauguration of Donald Trump, who has expressed disagreements with current US policy. Kirby acknowledged that the continuing sticking point in attempts to reach a new agreement with Moscow was Washington’s failure to keep its pledge to separate supposedly “moderate rebels” from the fighters of the al-Nusra Front, the Syrian affiliate of Al Qaeda. The “difficulty” is that the only significant armed opposition forces in the regime-change operation orchestrated by Washington and its allies consist of al-Nusra and ISIS, both offshoots of Al Qaeda, which for the decade-and-a-half of the “war on terror” has been portrayed as the foremost threat to the security of people of the US and the world.